Not being one to hammer a swim I took a chance on fishing in the vicinity of where I'd seen the grebe catch a fish last time out. Sure enough the bird was working the area again yesterday, although without any apparent success. It was a chance on two counts. The weather was supposed to be the reverse of Tuesday's - starting dry and sunny and turning wet - and my chosen swim was facing the oncoming wind. I'd had a chat with a guy alternating between pole and tip rod who was bemoaning the lack of fish. Ten in a session was his best, mostly small stuff. As I finished setting my gear up I saw him net something. Seemed like a good start for him at least as he hadn't been there long before I arrived and that was his first of the day. I was hopeful. 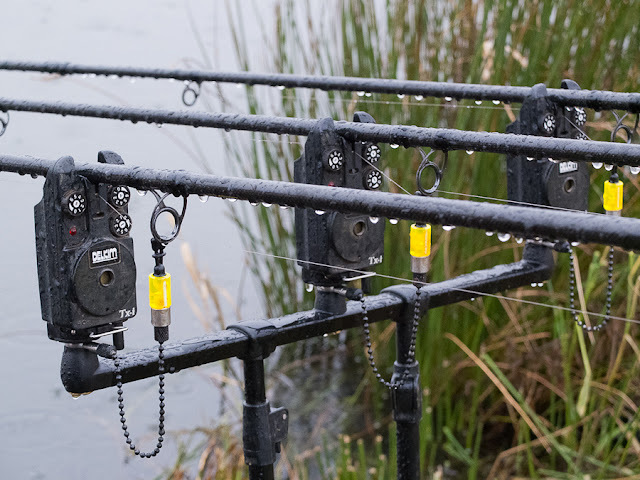 The rigs and everything were just as I'd left them requiring bait adding to the hooks. Again a method feeder went out as far as I could heave it with the maggot feeders dropping in closer. Although I had the rods set up nice and level my seating arrangement was a bit cramped. 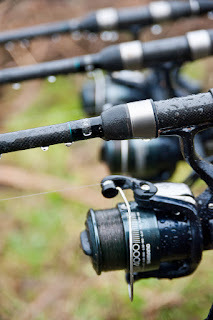 If the rain came in I'd be struggling to get the brolly up in a way that would allow me to get at the rods. It didn't take long for the sun to disappear behind a curtain of grey, the wind swinging westward. I wasn't cold despite the breeze so the rebaiting and recasting went to schedule. The only birdlife of interest, apart from the grebe, was a noisy wren in the reeds and sedge to my right. There were even fewer fish in evidence. By noon the wind swung to the south and eased up in strength. Although cool it wasn't cooling. With my chair tipped slightly forward I had to get up and stretch my back from time to time. Three days of carrying my burden was making it ache already and sitting in a slightly awkward position was doing it no favours. I could use my barrow at Goat Lake, but I can't be arsed! Two blokes walking round the asked how I was faring and I asked them how the other angler was doing. He'd had one roach. That first fish of the day had been a one-off. I had aglance in his direction to see he was packing up. It was growing gloomier and I reckoned he'd timed it right to avoid the rain. Sure enough, the wind picked up a little, but swung round slightly to the east, then around one thirty I saw a couple of raindrops hit the water. As the wind had shifted to my left I was able to get the brolly up to shelter me and my rucksack while allowing me to reach the rods to recast or strike. Those first few drops were soon followed by many more. The lake's surface had calmed off to a smooth carbon grey pock marked by closely spaced tiny water craters. Although persistent the rain wasn't heavy. Sure it sounded like a thousand mice were scampering over my umbrella, but out from its cover the rain was quite light. It was wet though, especially on my right leg and arm which the awkwardly arranged brolly wasn't covering. So long as I'm warm I can just about bear fishing in the rain. With the maggots under cover I carried on rebaiting and recasting. Nonetheless I got that dismal feeling of an inevitably impending blank. I'd pack up early around quarter to four. As the leaving time approached the imaginary mice were replaced by feather footed fleas lightly leaping on my brolly. The rain had eased off and the sky looked brighter. Should I stick it out until the bitter end or get away while it was dryish? With the rain all but passed my optimism returned tempting me to hang on. No, I'd pack up, but take a rod for a cast around in another area once I had all my gear in the car. That was the plan, but when the car was loaded the rain came on again and I decided I could have a cast around another day. The weather for the next few days of my 'holiday' is forecast to be more of the same. Rain, more rain and a little respite in the form of showers. So long as it stays mild enough I think I'll give it another session or two. I'm not sure why the place has fired my enthusiasm the way it has. Probably a mix of the unknown, but also the fact that it is a quiet place to fish and it suits my preference for fishing little and often. I'd much rather do half day sessions every two or three days than full days a couple of times a week. Mind you, I might squeeze a dawn to dusker to give me a chance to do a proper baiting up and see if that works better than my current approach.